This was another Kimberly Einmo Mystery Quilt when we were all in the Rheinland Pfalz Quilt Guild. We gathered on a cold cold night, probably in January, and cut and stitched in the gathering room at the Ramstein North Chapel. Not only did we make great quilts, but we also had a potluck supper, great food. 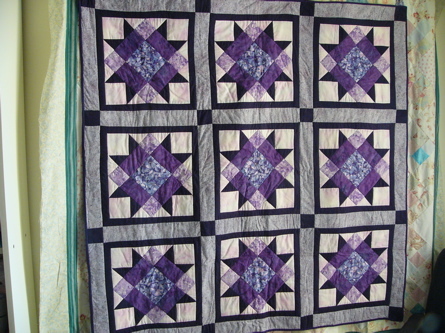 One of my earliest quilts. This entry was posted in 2001, Attributed, Germany, Machine pieced, Machine quilting, Quilt Friends.